The mission of the Potsdam College Foundation is to ensure a quality future for SUNY Potsdam. In cooperation with the staff of SUNY Potsdam, the Foundation reaches out to the College's communities, promotes a positive image, forges and nurtures relationships, secures and stewards private funding and augments the College's resources. What is the Potsdam College Foundation & how does it help SUNY Potsdam? The Potsdam College Foundation is a non-profit corporation, established in 1968, to steward the continued growth of private giving in support of SUNY Potsdam. The Foundation is governed by a volunteer Board of Trustees which includes representation from SUNY Potsdam's alumni, faculty, faculty emeriti and students, as well as the regional and national community. Gifts to the Potsdam College Foundation are used to provide annual support to meet ongoing campus needs and to establish permanent endowments to support such things as student scholarships and programs. The Foundation also actively encourages bequests and other gifts of a deferred nature, including annuities and trusts. Gifts to the Potsdam College Foundation are tax deductible. The Foundation Board of Trustees oversees the management and investment of private funds given to SUNY Potsdam through the Potsdam College Foundation. In addition, the Foundation owns art objects and cultural artifacts that are used for teaching and for display on the campus. 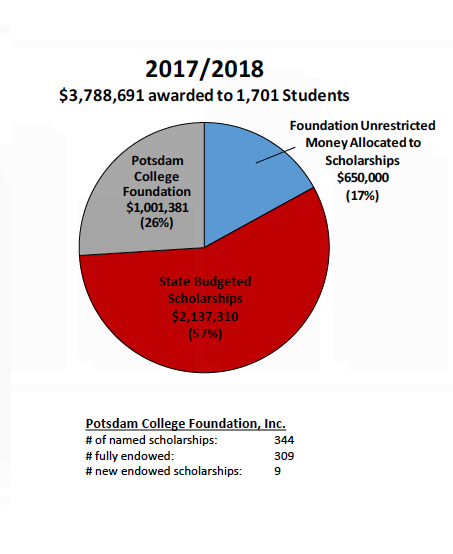 The total assets managed by the Potsdam College Foundation as of the end of Fiscal Year 2017/2018 (June 30, 2018) were nearly $40 million. The market value for the Endowment Fund as of June 30, 2018 was $32,917,413.